KENNEDY KRIEGER INSTITUTE MURAL UNVEILING!!!!! On August 29th, 2002, Kennedy Krieger Institute in Baltimore, Maryland unveiled the work of Yemonja Smalls, then a Johns Hopkins University predoctoral intern in the Neurobehavioral Unit. 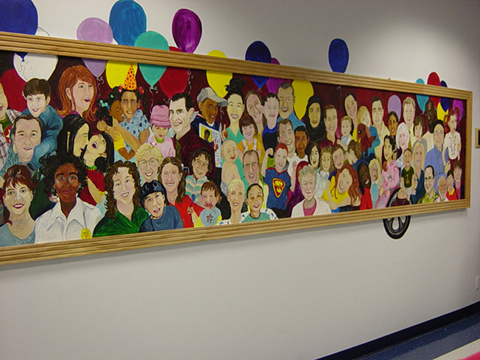 Yemonja was the winner of the Service Excellence Committee's Broadway Mural Contest. Yemonja had the opportunity to work with children who exhibit challenging behaviors as well as with the interdisiplinary staff that provides specialized pediatric medicial and therapeutic care for them. Based on her experiences, she conceptulized a theme that appropriately depicted Kennedy Krieger Institute as a comprehensive Institute. "I chose the title 'We are Kennedy Krieger' because it ties us in as a multifaceted unit. And, for many of those who work and received services here, we are a family," says Smalls, a self trained artist who has been painting since she was a child. While working during odd hours of the night and early morning, Smalls enjoyed using her natural talents and was amused by the children's reactions when they saw her painting. " I was particularly touched when one child who was in a wheelchair watched me paint for a while, then calmly said, 'God bless you, God bless your hands'. I have been blessed in listening to the stories of parents and getting hugs from the kids." One of the children pose with the artist. 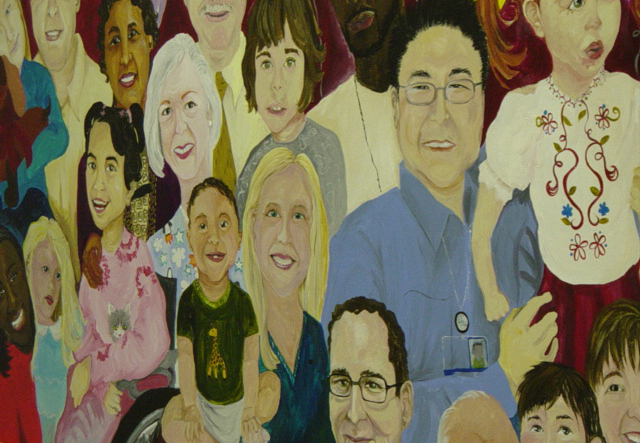 This 13 x 2 feet mural hangs in the first floor lobby of Kennedy Krieger Institute.